Be still my salad loving heart. 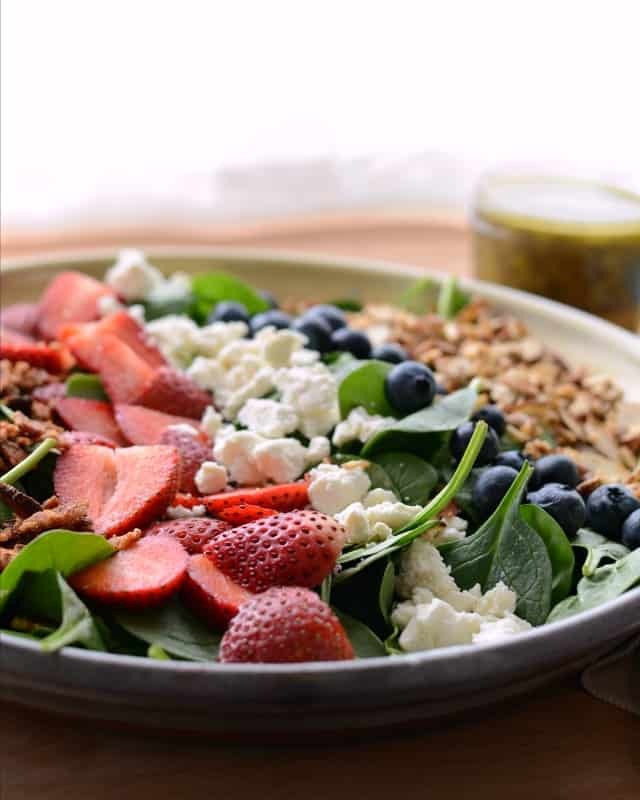 Berry Spinach Salad with Citrus Poppy Seed Dressing is a keeper, friends. I call this salad “girl food,” which means it’s just the perfect dish to make when you are having your best friend over for a playdate. 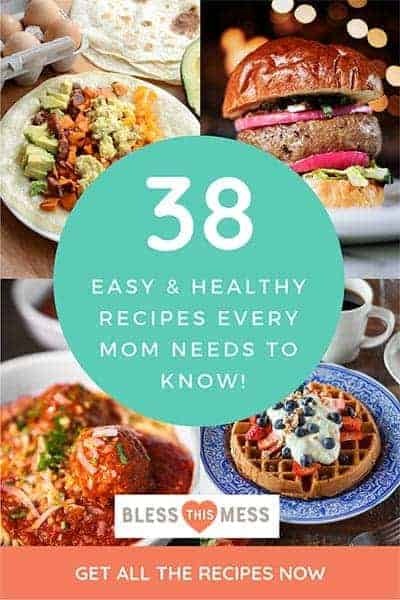 Feed the kids quesadillas or PB&J, send them out to play or get out the train tracks, and then hide in the kitchen to scarf this down with your favorite free therapist. That’s what best friends are, right?! I’ve been dreaming of this salad for weeks and finally made it, took pictures, and then had a big old platter of really pretty salad all to myself. I took a look at that salad and thought of calling Thomas home for lunch, laughed, and then called one of my favorite local friends. She brought her babies over and we had a great therapy session over that salad. It was glorious! And let’s talk a second about how quick but delicious homemade dressing is! 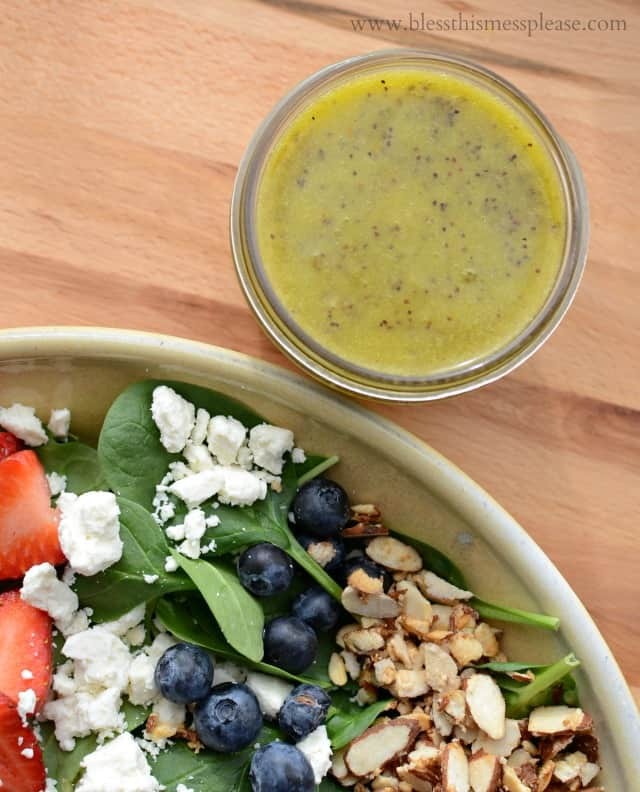 This citrus poppy seed dressing is awesome, and I’m sad it’s all gone. All you do is measure some things into a jar, add a lid, and give it a shake. WIN! It’s such an easy process, but I know lots of people are a little intimidated by it. Have no fear, it’s easy and tastes so much better than anything you can buy. If you aren’t on Instragram or my personal facebook friend then you might not know I’m having a baby! I’m due at the end of July and have been suffering through early pregnancy since the beginning of December. I’m sick, and sick of being sick. I’m tired, I have no desire to do anything I normally love, and I’d honestly tell you that I get a bit depressed while pregnant. Some ladies get their depression after the baby comes, but all mine is before; the baby gets here and I couldn’t be better. It’s hard and I’m struggling on a daily basis. It’s wonderful to have other children, though. I don’t have a choice when it comes to getting out of bed, making meals, and keeping the house in some sort of order, because little people demand it. They keep me moving. I feel odd writing this, but I know when I’m really not feeling well mentally, all I want to do is hide. I want to scroll the hours away on my phone because it’s easier than being present. I know it’s not healthy, so I got rid of all of my apps and now when I need to hide, I do it in a book. It’s better but still just a way of avoiding life. Some days are better than others – today has been fine, yesterday was one of the worst… it’s a hit and miss thing. I’m 14 weeks now, so I hope I’ll get a little break from the throwing up and depression in the coming weeks, before the last trimester when it’s all unavoidable again. Until then, I’ll keep putting one foot in front of the other and pretending things are ok. Faking it until you make it is ok once in a while, right? See, we just had a little therapy session over girl food and I feel better. I told you this salad was glorious, and so are girl friends! For the salad: Add all of your ingredients to a bowl and toss to combine. Or you can add the spinach to a shallow bowl and then line the toppings on top (this is what I did), toss before serving. For the dressing: Add everything to a mason jar, add the lid, shake to combine. Shake well before using. You can dress the salad right before serving (the recipe makes more than you will need) or you can let everyone dress their own, pouring the dressing right out of your mason jar. I like to let everyone add their own dressing. Store leftover dressing in the fridge for up to 2 weeks. I have to let it sit on the counter while I make dinner because my oil gets thick in the fridge. Excellent dressing to have on hand! Here’s a little tip on the candied almonds. Just buy a bag of slivered almonds that has about a cup in it. Add that and 2 tablespoons of granulated sugar to a heavy bottomed skillet over medium to medium-high heat. Keep and eye on it and stir it occasionally until the sugar in the very center of the pan starts to melt, then stir constantly. Stir until all of the sugar melts and it just starts to look like the almonds are toasting. This should happen quickly once the sugar starts to melt, maybe one minute to 30 seconds. You can’t walk away or you’ll burn your nuts, but once you make it a time or two, you’ll make them all the time! It’s easy. Eat whatever nuts you didn’t put on the salad later for a snack. So good! Thanks for letting me put all that out there. Send me all the good vibes and any tips and tricks for getting over morning sickness and baby-induced depression. I’d love to hear your thoughts. Big hugs on your tough pregnancy! 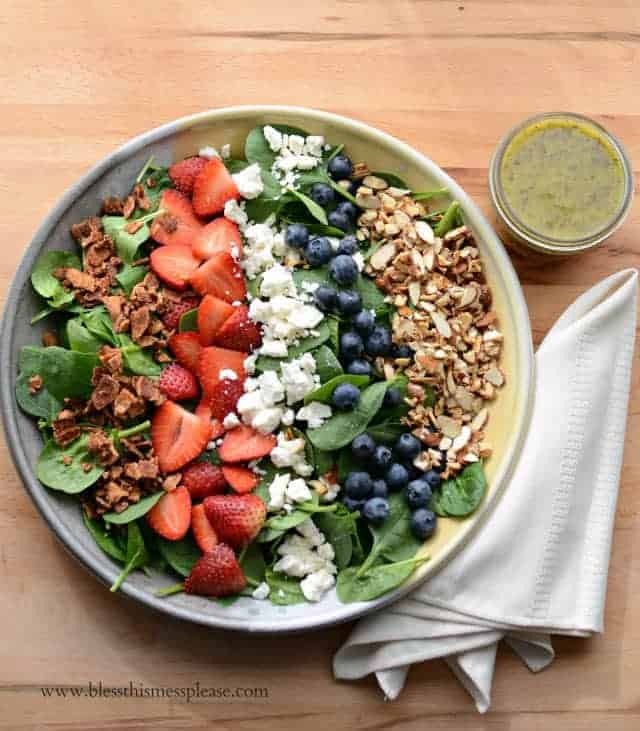 This salad is gorgeous–I’ve been taking care of a sick family member for a month now, and am introducing them to healthy delicious food, and this salad is being added to their menu! This looks and sounds SO yummy! So sorry that this pregnancy has been so hard. 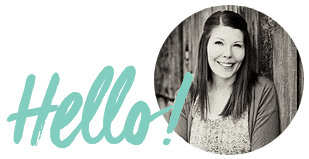 I wish I could do more to help from here, but know that I’m cheering for you, friend! Can’t wait to try this citrus poppy dressing! Hugs to you for this pregnancy. I just had my 5th and was sick for so much of it! Glad you know you get better as soon as that beautiful baby gets here. Hang in there, it will all be worth it in July! It mush be that 5th baby! I’m secretly hoping it’s another girl and that we just have too many hormones between the two of us 🙂 I was a lot more emotional with my girl! Looks delicious. Prayers for your pregnancy. Sorry it’s a rough go for you. Oh friend, I hope you start picking up soon! I wish I could come by with my boys to wrestle your boys and then eat all the salad we could. Good luck! I get depressed my first trimester. The never ending sick and tired just wears a girl down. I don’t have any advice, I just want you to know that you’re not alone. I hope you’re feeling a bit better these days.